The Coppock curve or Coppock indicator is a technical analysis indicator for long-term stock market investors created by Edwin Coppock, first published in Barron's Magazine in October 15, 1962. 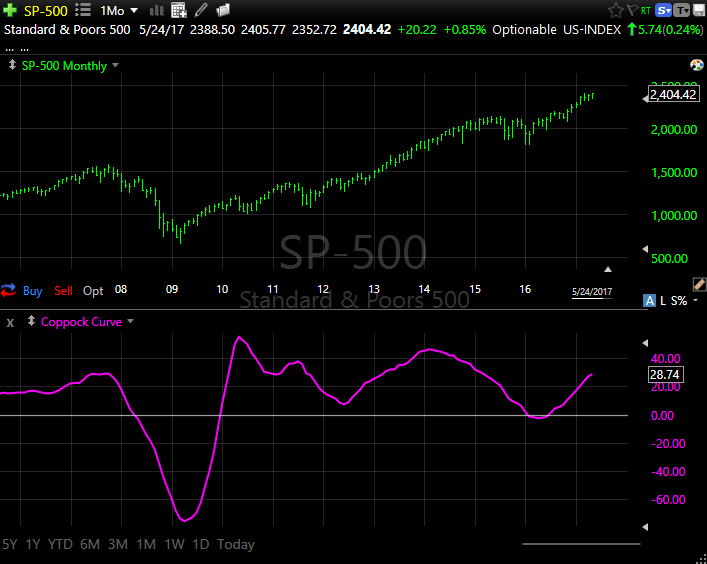 The indicator was intially designed for use on a monthly time frame but can be used on shorter time frames as well. It is the sum of a 14-period rate of change and 11-period rate of change, smoothed by a 10-period weighted moving average. A buy signal is generated when the indicator is below zero and turns upwards from a trough. No sell signals are generated. The indicator is trend-following, and based on averages, so by its nature it doesn't pick a market bottom, but rather shows when a rally has become established. Where p is the short ROC period which must be an integer. Where q is the long ROC period which must be an integer. Where w is the WMA period which must be an integer. A Coppock Curve 11, 14, 10 can be written as follows. 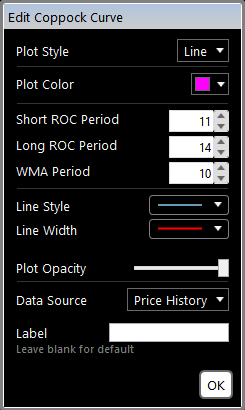 To write a version for the previous bar instead of the current bar, you would need to manually add 1 to all of the bars ago parameters. Read more about using the Coppock Curve on Investopedia.